Wedding is a very special event in most people’s lives. Meeting your state’s Governor personally is also a thrilling experience. 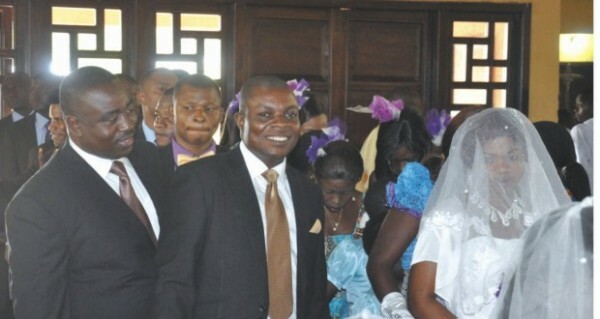 One indigene of Benue State was lucky enough to have the Governor as his best man at his nuptials. Governor Gabriel Suswam of Benue State attended the wedding ceremony of Peter Anyiman, a cook serving Catholic Priest, Rev. Father Michael Tumba, that was held last Saturday at Our Lady Perpetual Help Cathedral, Makurdi. Making a speech at the wedding reception, Suswam noted that the groom had demonstrated a true commitment to his duties by serving Tumba in Abuja for 18 years, and deserved to be honoured. The Governor further urged people to take their jobs as seriously, and proceeded to adjusting the groom’s tie and wiping sweat from his forehead. Anyiman commented that he was a wery lucky man to have the Governor of the State to serve as his best man, adding that he could not have dreamed of a better wedding gift.